This may be the only case of a Pokemon from the Blue version being lower than its corresponding Red version. I'm not necessarily a huge fan of Electabuzz, either, but it's a bit better than Magmar, so that's why the weird duck-billed platypus is lower. Magmy doesn't have a ton going for it. Fire types are not very good in this generation of games (and still aren't, but especially back then), so it gets snuffed out fairly easily. It also doesn't learn a lot of good moves naturally--it gets Flamethrower and Confuse Ray and...well, that's about it. 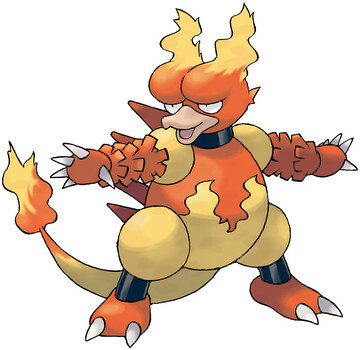 I've also discovered Magmar evolves into Magmortar, which is even weirder and has a bullhorn/fire bazooka weapon. I know I'm not supposed to take other games into account, but that lowers Magmar by a letter grade.